Mobile Application development is one of the fastest growing industries globally. Mobile App technologies have changed the way humans are living today and businesses are done. Mobility is changing the way things are done in every aspect of life. It is changing the shopping behavior of people, providing new venues to do business, empowering people to do range of activities while on the move. 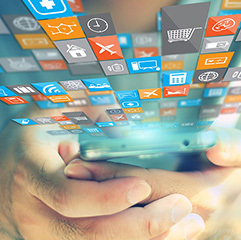 Businesses feel actual need of having mobile app to build customer loyalty, brand reinforcement, increasing visibility, providing more accessibility, a major sales channel as well as connecting more closely with the customers. Recent data from eMarketer finds that people in United States spend more time on digital than on any other media, including television. This same research finds that within the whopping 5+ hours per day Americans are spending in digital, a good amount of that time (2 hours, 21 minutes) is being spent on a mobile device (phone or tablet). SpryBit specializes in Mobile application development with experience of delivering 200+ mobile apps across different industry verticals. Our goal is to create compelling experiences for the end user, just as we seek to uphold the standards of excellence and maintainability that our business customers have come to expect. How we build mobile apps? Our mobile application development business is built on effective communication and consultation practices, extensive testing, and constant refining of interactive processes. We are dedicated to Quality, and we strive to ensure that every screen, will look amazing, operate efficiently, and tell your story effectively. We invite you to join us if you would like to participate fully in what has become a daily experience for inhabitants of the world. We can show you the way — let’s build a great mobile app together. At Sprybit our core offerings for mobile application development includes working across different platforms like iOS, Android, Phonegap,IOT apps, Embedded apps and Games to name the few.